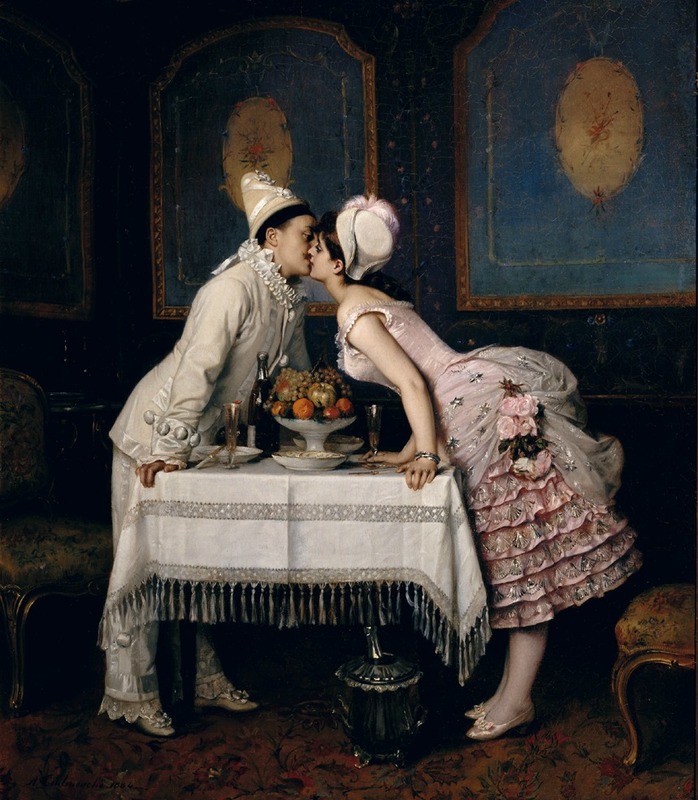 The Kiss by Auguste Toulmouche, 1870. During the Victorian era, fancy dress balls were one of the grandest and most fashionable ways for a society hostess to make her mark. These magnificent, costumed affairs were widely reported in 19th century newspapers, with a great deal of attention paid to who was wearing what. Guests dressed up as historical figures such as Marie Antoinette or Napoleon. They also wore more creative costumes—many of which were recommended in fancy dress advice manuals and costume books. In today’s article, we look at a few of these costumes and at some of the more famous Victorian fancy dress balls held at Brighton Pavilion, Warwick Castle, and Devonshire House. In addition to Starlight, the Brighton fancy dress ball of 1868 featured several “Watteau Shepherdesses,” many ladies in “Hungarian” costume, and a woman dressed as Titania from Shakespeare’s A Midsummer Night’s Dream. Of the more creative costumes, the Kentish Gazette reports two women dressed as “Winter” in gowns of “swan’s down flakes.” There was even a woman dressed as a telegraph—though her costume is not described. 1893 House of Worth 18th Century Revival-Style Fancy Dress Costume. Our Imitative Aristocracy by Joseph Keppler, Puck, 1883. 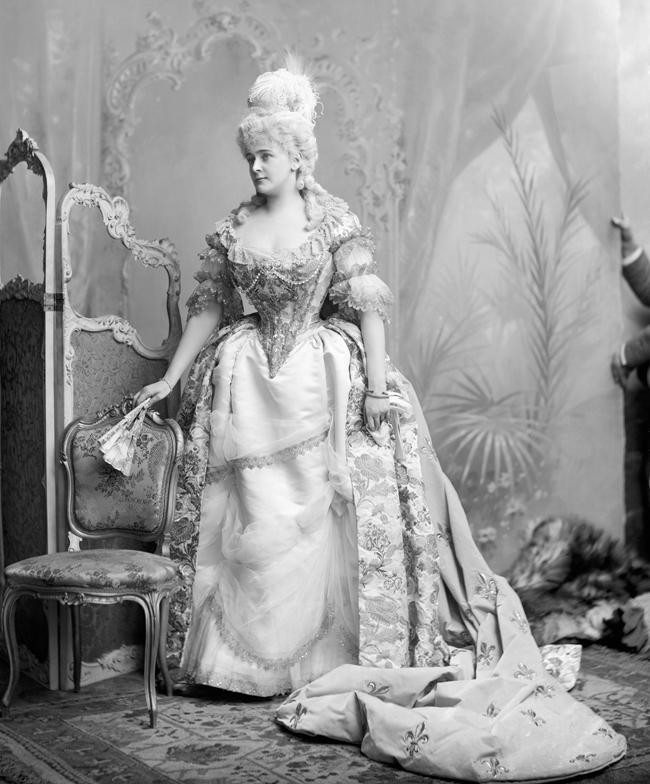 Countess of Warwick as Marie Antoinette at the Devonshire House Ball in 1897. Duke of Devonshire as an Ambassador from a Holbein Painting at the Devonshire House Ball, 1897. When it came to costumes for a Victorian fancy dress ball, the only limit was one’s budget and creativity—and, of course, the dictates of one’s host. Fancy dress balls where the guests were asked to appear in costumes worn by their ancestors or in costumes relating to a particular theme were very popular. 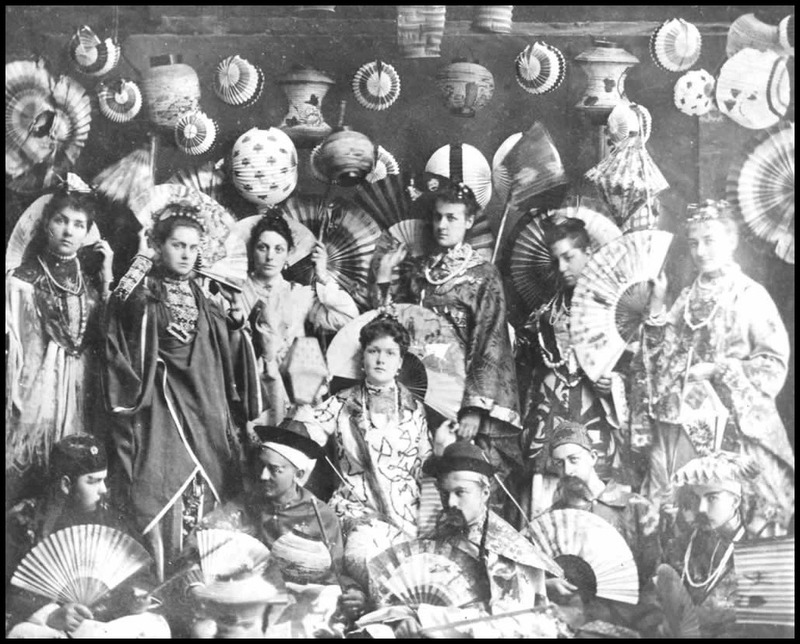 The below photograph shows an Asian-themed fancy dress ball from 1886. Photo of a Fancy Dress Ball in Coburg, Ontario by Harry Irwin, 1886. Dressing up as an actual character from history—such as Louis XV, Queen Elizabeth I, or Charlotte Corday—was especially en vogue. As was dressing in a more generic historical fashion, such as costumes depicting a Roman woman or an “Eastern” woman in harem pants. The Turkish-style fancy dress costume shown below is a perfect example of this. 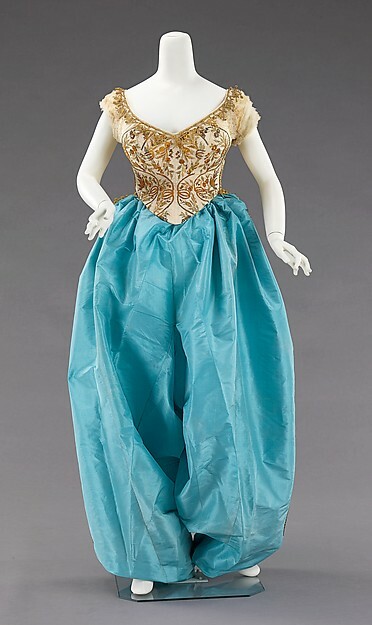 Designed by the House of Worth in 1870, it is made of silk with an embroidered bodice. 1870 House of Worth Turkish Style Fancy Dress Costume. 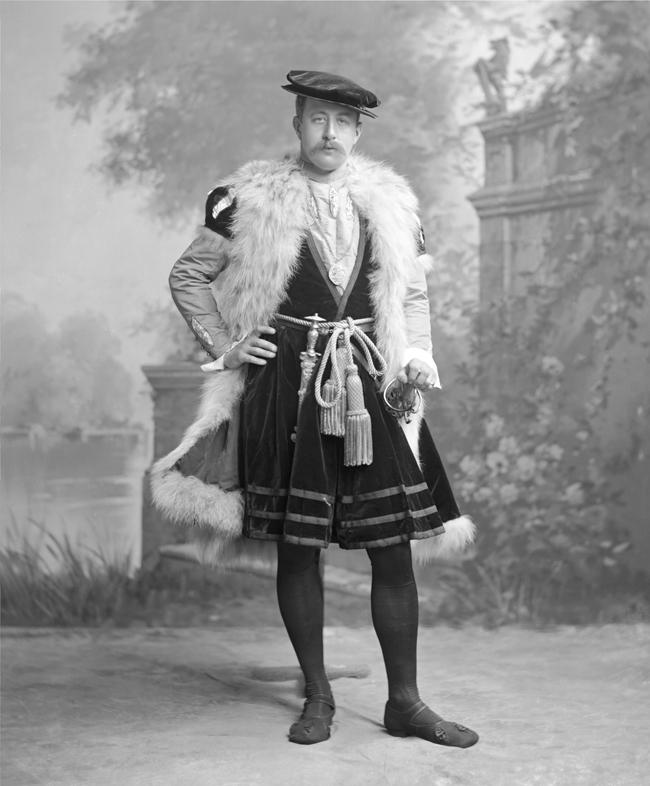 As you may have noted from the descriptions of costumes at the Brighton fancy dress ball, not all costumes were as decadent as those worn by the Countess of Warwick. In addition to dressing as seasons such as winter, spring, and autumn, ladies expressed their creativity by dressing as fairies, comets, and butterflies. 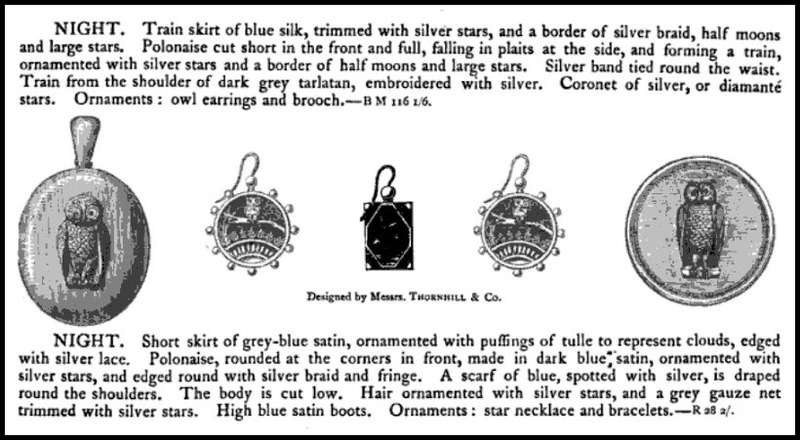 Some women attending fancy dress balls in the late 19th century even chose to come dressed as “Night.” Obviously, the interpretation of what “Night” looks like may vary, but in her 1881 book Characters Suitable for Fancy Costume Balls, Mme. Marie Schild gives two possible costumes. Illustration from Characters Suitable for Fancy Dress Costume Balls, 1881. Similarly, in his 1880 book Fancy Dresses Described, author Ardern Holt includes a lady’s costume for “Night.” He also suggests materials for costumes that are still popular today, including such Halloween favorites as witches and cats. 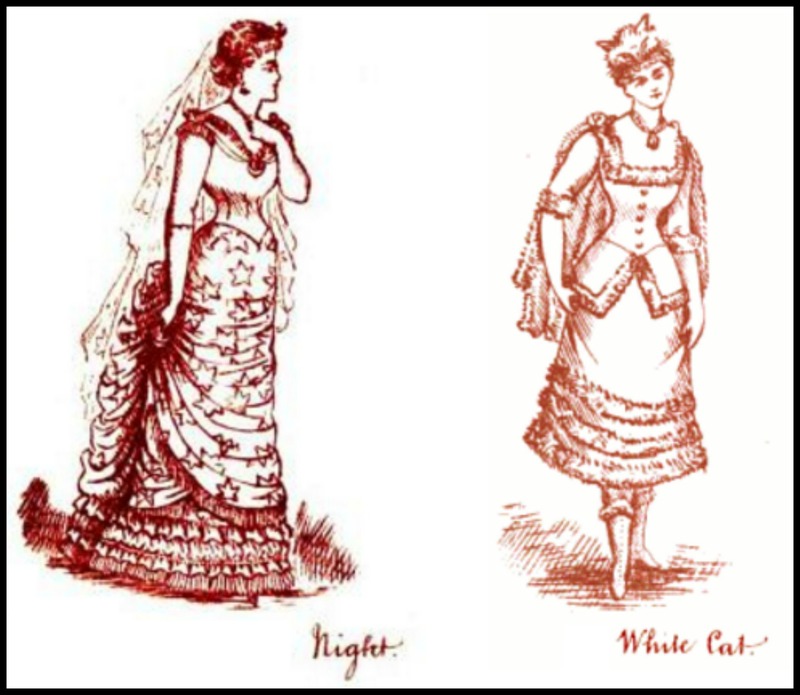 Illustrations from Fancy Dresses Described by Arden Holt, 1880. Some of the costume ideas in Victorian era fancy dress books are quite whimsical. For example, Mme. 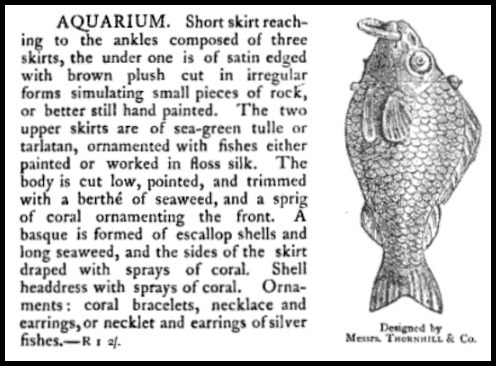 Schild suggests a costume for a lady wishing to attend a fancy dress ball as an “Aquarium.” I found this particularly amusing in light of my recent article on the popularity of goldfish globes in the Victorian era (article HERE). 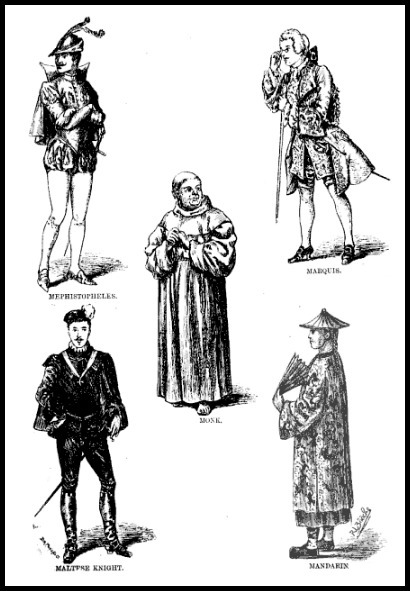 Illustration from Male Character Costumes for Fancy Dress Balls and Private Theatricals, 1881. The fancy dress balls at Brighton Pavilion, Warwick Castle, and Devonshire House were not the only fancy dress balls of note during the Victorian era. When Prince Albert was alive, Queen Victoria herself held fancy dress balls at Buckingham Palace—including a “Juvenile” fancy dress ball in 1859 at which Princess Helena and Princess Louisa dressed as peasants and Prince Arthur and Prince Leopold dressed as the sons of Henry VI. There were also less prestigious fancy dress balls held at local assembly halls or at hospitals. 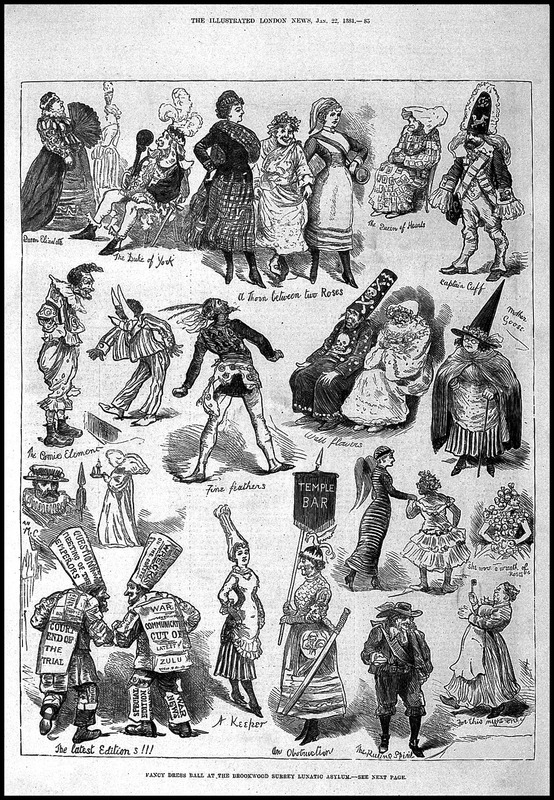 An 1881 edition of the Illustrated London News even reports a fancy dress ball held at a lunatic asylum. Brookwood Lunatic Asylum Fancy Dress Ball, Illustrated London News, 1842. 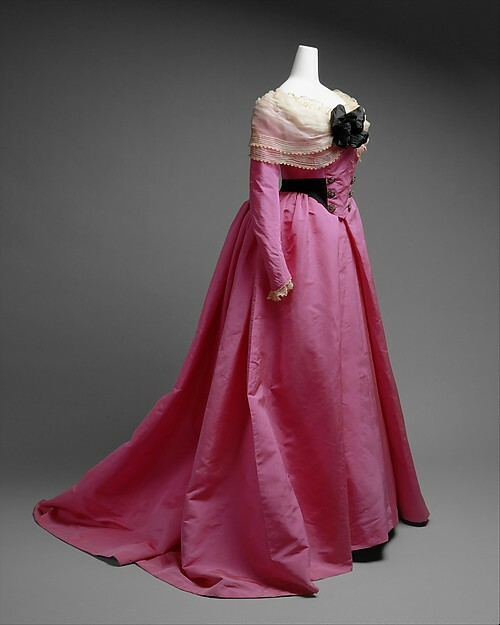 Clothed in fancy dress, a Victoria era party guest could pretend to be someone else. Costumes—especially those with masks—allowed their wearers to engage in flirtation, intrigue, and other brazen and risqué behaviors, the likes of which were generally frowned upon in polite society. 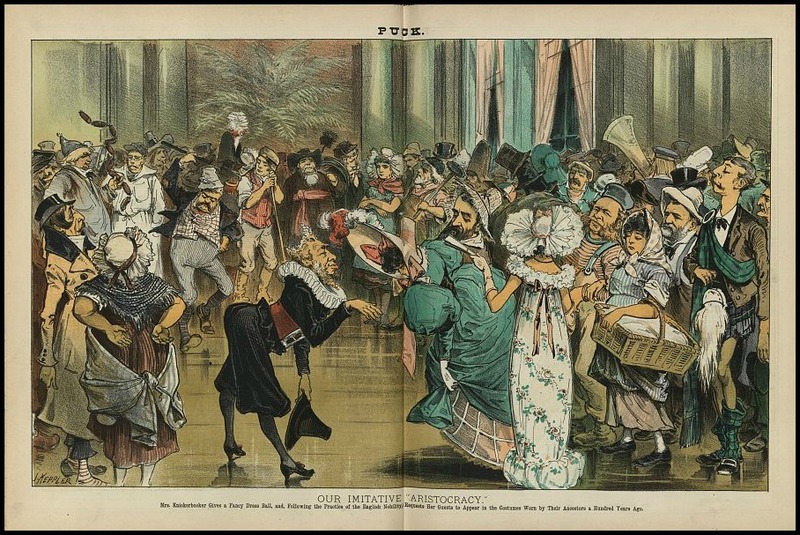 With that in mind, it is easy to understand why so many in the Victorian era enjoyed attending a fancy dress ball—and why fancy dress balls continued to be popular well into the 20th century. “Brighton Fancy Dress Ball.” Kentish Gazette. January 28, 1868. “Fancy Dress Ball at Lunatic Asylum.” Illustrated London News. January 22, 1881. Horn, Pamela. Pleasures and Pastimes in Victorian Britain. Amberley Publishing, 2013. “Juvenile Ball at Buckingham Palace.” Belfast Morning News. April 14, 1859. The Lady’s Realm. Vol. 2. London: Hutchinson and Co., 1897. Male Character Costumes for Fancy Dress Balls and Private Theatricals. London: Samuel Miller, 1884. Norris, Herbert. 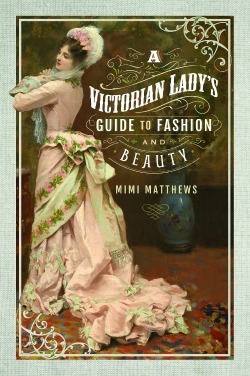 Nineteenth-Century Costume and Fashion. Vol. VI. Mineola: Dover Publications, 1933. Schild, Mme. Marie. Characters Suitable for Fancy Costume Balls. London: Samuel Miller, 1881. Truth. Vol. XI. London: Queen Street, 1882. Vanity Fair. Vol. XXIII. London: Ranken and Co., 1880. Your costumes have been much more creative than mine! What a great mom you had, Sarah. As usual, writing and illustrations are top notch! Thank you! You’re very welcome :) I’m glad you enjoyed it! You should definitely keep it, Sarah. You’d regret it if you got rid of it. it did service several years later with two others rapidly made for a Girl Guides glee concert with medieval ballads. I can’t believe I made 3 medieval costumes, and 3 Japanese costumes [3 little maids from school] for the girls who were doing their Entertainer badge, I must have had more time, energy and enthusiasm when I was 17!